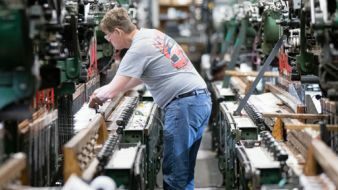 U.S. employers added 196,000 jobs in March, beating Wall Street's expectations for an increase of 180,000, evidence that many businesses still want to hire. Businesses are confident the economy remains on a firm footing. The Labor Department says the unemployment rate stayed at 3.8%, near the lowest level in almost 50 years. The labor force participation rate was also little unchanged at 63 percent. Average hourly earnings rose by 4 cents to $27.70, following a 10-cent gain in February. February's gain of 3.4% was the best in a decade.